The newest photo essay from Electrical News showcases some of the great people behind the exhibits at this year’s NECA Show. If you’ve misplaced any contact information from a NECA Show exhibitor who maybe had that “killer app” perfect for your company, see if you can find them online! Please visit their booths to check out their winning products! Did you know you can see a full list of the 2012 NECA Show exhibitors online and customize a map of the booths you want to visit while in Las Vegas? View company profiles, visit their websites, plus schedule and map the ones you don’t want to miss. Try it out today! The electrical construction industry’s leading trade expo, the NECA Show, and publication, ELECTRICAL CONTRACTOR magazine, joined forces at the recent 2010 NECA Show to create the first-ever NECA Showstopper Showcase, where 15 stand-out products and systems were recognized as the most significant of the event. Judged by a panel of electrical contractors and magazine contributors, submissions to the new NECA Show Showstoppers Showcasing (replacing the former New and Featured Product Room) were evaluated on the Show’s opening day, Oct. 3. ELECTRICAL CONTRACTOR’s annual Showstoppers feature recognizes the most innovative products and systems featured in this year’s exhibition among many new products submitted. Displayed at the front of the show hall with blue ribbons, this year’s Showstoppers offered diverse products, equipment and systems from a range of manufacturers and systems developers. Siemens Industry, Inc., won for the first 600V DC enclosed solar/photovoltaic disconnect switch UL listed for use with three, separate 600V DC circuits. “We are pleased and excited that those viewing our display recognized that our new Solar Switches represent a significant design innovation to service the emerging solar energy market,” said Dennis Krizan, product manager, safety switches, Siemens Industry, Inc.
GE Energy won for its electrical vehicle charging station, showing both residential and commercial chargers. “The key to ours is the design,” said Chris Bowler, general manager of marketing, who demonstrated the charger’s retractable cord for ease of use. “Nobody has ever addressed the transmission/distribution contractors,” said Todd McCormick, president, McCormick Systems, Inc., whose company won with transmission and distribution estimating software. Schneider Electric also won for its electric vehicle charging station due to become available in two to three months. Its features include a delay function for charging at specific times of the day for better energy management. “The biggest thing is that the bending and cutting are brought into the product along with a full range of factory fittings that results in a safe, low-cost installation,” said Gregory Cambrun, RCCD, national sales manager, Wiremaid Products Vision, for its Pro-10 series cable tray. I’m really looking forward to the upcoming convention in Boston! It sounds like NECA has some great activities planned, and I intend to participate in as many as I can. September 15, 2010, marks the one-year anniversary since Federated was chosen as an Official Partner of NECA. We’re very proud of our relationship with such a respected organization. One thing I especially like about NECA 2010 Boston is the “Connecting the World” tagline that was chosen for this year. 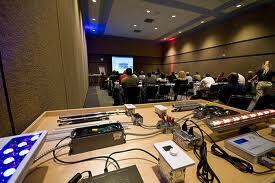 The electrical contracting industry is constantly evolving to keep up with the latest technology and regulations. At Federated, we recently introduced Federated’s Shield Network, an online resource which is designed to help our clients connect to the latest in a wide range of risk management tools and services. Stop by our booth #1101, whether you’re currently insured with Federated or just looking for more information on our programs or Federated’s Shield Network. We want to connect with you! The NECA Show featuring over 240 exhibitors with products and services specifically for electrical contractors was unveiled today immediately following the Opening General Session. 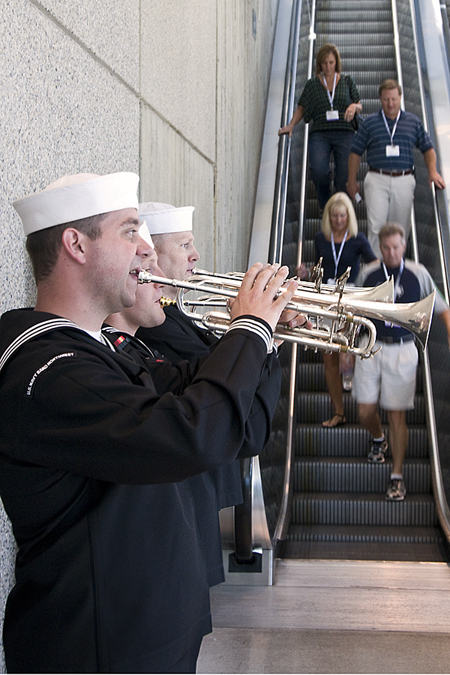 The Northwest Naval Band, sponsored by Helmets to Hardhats, opened the Show floor today with great fanfare, and thousands of attendees flooded the halls to see the latest and greatest. Couldn’t make it to Seattle? Check out over 100 products in the virtual New and Featured Product Room online. Ginger Wilson is also tweeting some of the exhibitors that catch her eye on twitter.com/NECAConvention. Subscribe to her tweets today — she gets the first scope on cool prize giveaways at the booths, but you need to be on Twitter first!